The Short Version: In the heart of Los Angeles, the Downtown Women’s Center is a beacon of hope to many women facing an abusive relationship or financial disaster. The center’s compassionate care offers homeless women many helpful resources when times are bad. 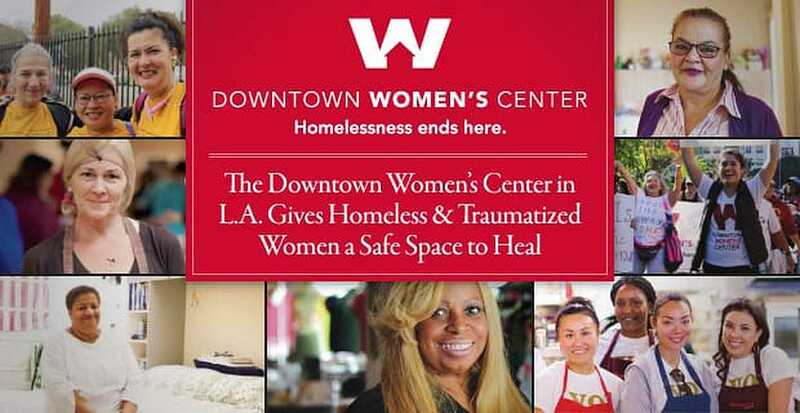 The Downtown Women’s Center endeavors to end homelessness in L.A. by catering to the needs of women in poverty with services that include housing solutions, skill-building workshops, and accessible health care. Over 5,000 volunteers donate their time to support the community and give women the opportunity to better their lives. Since 1978, the center’s advocacy work has raised awareness about the hardship faced by women fleeing violence in their homes and having to start over from scratch. No matter what your circumstances, the Downtown Women’s Center welcomes you with open arms and lets you know you don’t have to face your problems alone. (Photo credit: Erica Hsu, www.ericakhsu.com). Jill Halverson was an outreach worker in Los Angeles when she was introduced to Rosa Arzola, a homeless woman living in a parking lot in downtown Skid Row. The two women struck up a friendship, sharing coffee and laughs every week, and Jill was amazed that such a kind, resourceful, and intelligent woman had been forced into such poor circumstances. This was 1975 when a lack of institutional support for mental illness meant many men and women, like Rosa, ended up on the street with no one looking out for them. Determined to help, Jill used the money from her own down payment fund to rent a storefront where she offered hot meals, clean clothes, and free showers to women living in poverty. This safe space became the Day Center of the Downtown Women’s Center, a nonprofit organization founded by Jill to serve women like her friend Rosa. Jill Halverson’s friendship with a homeless woman, named Rosa Arzola, inspired her to found the Downtown Women’s Center in Los Angeles. Founded in 1978, the Downtown Women’s Center opened its doors and hearts to homeless women in Skid Row. A passionate staff of social workers provides housing, job training, health care, and other resources to support people who’ve fallen on hard times. To this day, the DWC is the only organization in Los Angeles that caters services to single women living in extreme poverty. Such women are often victims of domestic or sexual abuse and in need of compassion and respect. 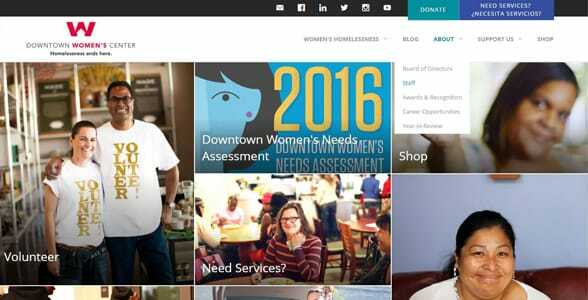 The Downtown Women’s Center is geared toward supporting homeless women in Los Angeles. From hot meals to hot showers, the center’s compassionate services help women who find themselves in desperate straits. The center relies on the community to fund and support their many services. You can sign up as a DWC volunteer and join a worthy cause helping single mothers, veterans, retirees, and other women with nowhere else to turn. Each year, more than 5,000 volunteers donate approximately 25,000 hours of services to feed, house, clothe, and rehabilitate the homeless. Their solemn mission is to end homelessness for good through their social work. 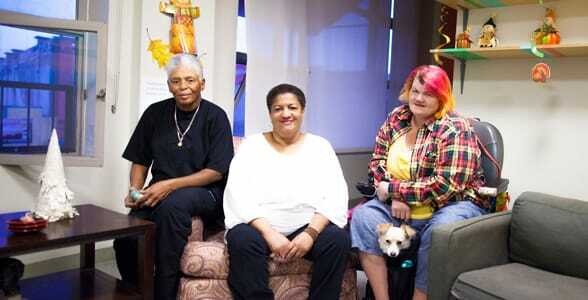 The Downtown Women’s Center champions homeless women with caring and steadfast advocacy. Each year, the Downtown Women’s Center helps an estimated 4,000 women recover their health and confidence by relying on a respectful support system. Women suffering from unemployment, partner violence, mental illness, and other personal crises often find a friend in this caring center. To foster long-term personal stability, the DWC provides many invaluable resources for women in poverty. Many of the women who end up at the Downtown Women’s Center have suffered some sort of trauma that led them to the streets. With personal therapy and treatment, the DWC health clinic helps the homeless recover from domestic abuse, mental illness, or other health issues in a safe environment. The Downtown Women’s Center implements trauma-informed care strategies so homeless women can heal and stay healthy. Every year, it sees over 1,000 clinic visits made by over 800 women. From HIV/AIDs prevention to group therapy, the DWC’s trauma recovery program gives people of all backgrounds a second chance at life. The DWC also offers Skills Enrichment Training to the unemployed so they feel prepared to enter the workforce in L.A. SET to Work and SET to Create are 12-week programs that empower women in poverty to improve themselves and achieve their goals. Volunteer-led workshops teach participants new skills, like sewing or candle-making, to give them a creative outlet and hands-on activity to focus on. Through these instructive and fun exercises, the Downtown Women’s Center builds the self-confidence of homeless women. The Downtown Women’s Center houses women in 119 on-site apartments. These affordable rooms come without any set time limits. Such a generous housing program gives women who have faced chronic homelessness a bed to sleep in and a reliable place to call home. Residents using the center’s affordable and supportive housing can also take advantage of its education and health resources. Individual case managers make sure the women in their care have everything they need to make a fresh start, including access to affordable housing elsewhere if desired. In 2016, the community-based housing sheltered 207 women, and 97% of the women housed by the Downtown Women’s Center have stayed housed permanently. While housing is an important first step to ending homelessness, the DWC realizes that only wraparound care and consistent support keeps people housed in the long run. Open 365 days a year, its Day Center offers a safe haven to rest, study, bathe, and eat in peace. The women who drop by the center are always treated with dignity and respect as they take advantage of helpful services like phone and mail access. Each year, the Day Center provides about 110,000 meals, 20,000 showers, and 40,000 changes of clothes in 3,000 loads of laundry to adults facing extreme poverty. Making education and opportunity more accessible, MADE by DWC is a hands-on program to employ homeless women in the Downtown Women’s Center’s café and gift store. Women go through a training course and individual counseling to prepare them for employment opportunities with the nonprofit. This social enterprise guides women to become functional members of society with job experience and financial stability. “I’ve come a long way, and I’m not stopping,” said Theresa, a graduate of a 15-week culinary program that connected women with jobs at the L.A. Kitchen. After earning a spot at the top of her class, Theresa became a Chef Assistant at L.A. Kitchen and now trains newly graduated women from the DWC-sponsored program. Through MADE by DWC, hundreds of women gain vocational skills and receive paid positions intended to rehabilitate and support the homeless. Last year, MADE by DWC placed 44 women in jobs, and 90% of those women completed their job terms or maintained employment thanks to the Downtown Women’s Center’s workforce development program. Homeless women often become homeless for different reasons than men — mainly, what distinguishes women on the streets is a persistently high rate of intimate partner violence. According to the Downtown Women’s Center comprehensive needs assessment, 55% of surveyed homeless women are survivors of domestic abuse, and 90% have experienced physical or sexual violence in their lifetimes. This is a disturbing pattern the Downtown Women’s Center seeks to end by advocating for victims of abuse, sexual assault, and other personal trauma. The DWC encourages Skid Row women to share their stories and affect change in their communities #SkidRowWomenSpeakOut. The organization also hosts Lobby Days where activists descend upon the state legislature and fight for the interests of homeless women in California. You can become a force for positive change in your community by volunteering with the DWC. In 2016, the DWC’s hard work paid off when Los Angeles voters overwhelmingly passed Proposition HHH, a $1.2 billion housing bond, by a margin of 76%. The proposition will generate funding for up to 10,000 units of housing for individuals experiencing homelessness in Los Angeles, empowering nonprofit organizations like the DWC. Rachel told us the 2016 presidential election actually had a positive role in the volunteerism in L.A. as well. “Recently, we’ve seen an influx of people wanting to do some good on a local level and fight for women’s rights,” she said. Meeting Rosa opened Jill’s eyes to the plight of homeless women and motivated her to make a positive change in how society treats women in poverty. 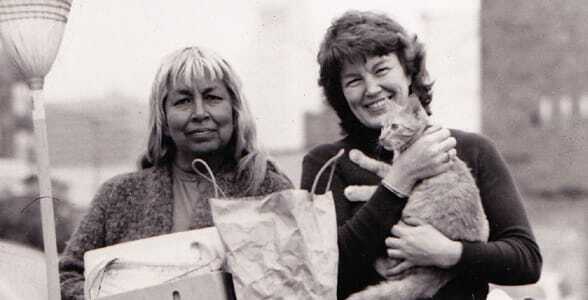 Their friendship was the foundation for the Downtown Women’s Center in Los Angeles, an organization that has helped thousands of women find housing, employment, and healing. From a single act of compassion, a charitable movement was born in the heart of Skid Row. Decades later, the Downtown Women’s Center continues supporting the needs of homeless women with diligent care and advocacy. From serving hot meals to offering permanent housing solutions, the DWC provides comprehensive resources for women living in extreme poverty. The center’s social workers do all they can to help women recover from traumatic or abusive circumstances and turn their lives around.